Historically, quilt fabric most often came from cast aside old clothing, so in the modern age of going green, give the old trend a try with a new twist. Everyone has a few pairs of old jeans in their closet that never seem to see daylight anymore, making them a popular item to recycle. This has resulted in some interesting fads, including the purse made from the bum of your blue jeans, commonly known as the "booty bag." For those wanting to give new life to an old pair of jeans in a more classic way, you may consider using them to quilt. Cut the waistband off of each pair of blue jeans and discard. Cut along the side seams of each pair of jeans, removing the front from the back. Cut each pair at the knees. You now have two sets of jean fabric—the upper portion of the jeans that extends from the knee up and the lower portion that extends from the knee down to the ankle. 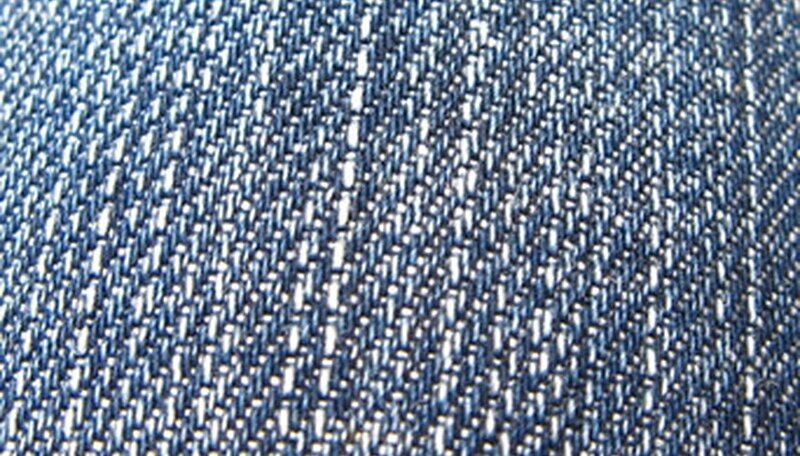 Measure across the knee area of one of the smaller sized pairs of blue jeans. This measurement will determine the size squares you will cut from the upper portion of the jeans. For example, if you measure 5 inches across at the knee, cut all of your squares so that they measure 5 inches by 5 inches. Determine the rectangle size to cut from the lower portion of the jeans. Your rectangle will measure in length the same as your squares, but the width will be half of the length, plus 1/2 inch for a seam allowance. Sticking with the 5-inch square example, your rectangle would be 5 inches long by 3 inches wide. Half of 5 inches is 2 1/2 inches. When you add the 1/2-inch seam allowance, you get 3 inches. Cut the squares from the upper portions and the rectangles from the lower portions. Sew the rectangles together to form squares. To do this place, two rectangles together, wrong sides facing, and stitch together along one of the 5-inch length sides, using a 1/2-inch seam allowance. Note that all of your denim pieces will be stitched wrong sides together. This will allow the raw edges to be visible on the finished product and fray over time, giving a "shabby chic" look to the project. Count out how many total squares you have and decide how many rows you want to sew and how many squares you want in each row. Double check your math when you are done by multiplying the number of squares per row by the number of rows. The number you get from this calculation is the number of squares needed to get that configuration. Stitch your squares into rows. Remember to sew each square to the one beside it with wrong sides facing. Stitch the rows together. Again, do this step with wrong sides facing each other. Measure your finished quilt top size, and cut the muslin backing and cotton batting to match. Layer the quilt with the muslin on bottom, then the batting, and then the quilt top. Pin these layers in place with safety pins. Tack the quilt together using buttons. Denim is generally a very thick material, so most quilters, especially hand quilters, would not want to quilt the fabric in a traditional way. Tacking will hold the quilt together in the same way but gives a different look and eliminates the fuss. To tack the quilt, simply sew a button at each corner where the squares of your quilt top meet. Make sure that your stitches go through all three layers, the quilt top, the batting, and the muslin.